INDIANAPOLIS (AP) Of the Indiana Pacers’ many strengths, playing with a bad memory might be their strongest. One night after allowing a franchise-record 49 points in the first quarter in a loss to the Hornets, Indiana played like a team coming off of a win. 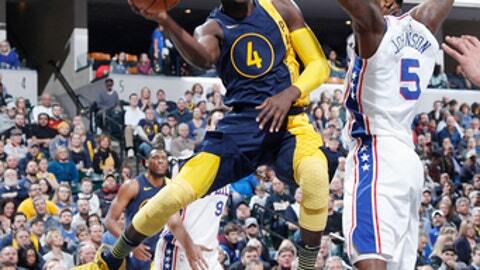 Victor Oladipo and Bojan Bogdanovic each scored 19 points and the Pacers relied on a strong second half to beat the Philadelphia 76ers 100-92 on Saturday night. ”I think we just did a good job in the second half of containing their shooters and making sure they didn’t get downhill,” Oladipo said. Oladipo added nine rebounds and four assists. Domantas Sabonis scored 10 points. The Pacers jumped out to a 40-27 in the second quarter but the 76ers pushed back, outscoring Indiana 24-10 over a seven-minute span for a 51-50 lead. The Pacers managed to put together a 12-6 scoring run to end the second quarter and take a 62-57 lead into the locker rooms. Indiana led 76-75 at the start of the fourth quarter, extended its advantage with an 7-2 run and held on with both teams were playing on the second night of a back-to-back. Joel Embiid played on both nights of the back-to-back for the first time in his career and finished with 24 points and 10 rebounds. Ben Simmons scored 10 points and added 11 rebounds for Philadelphia. Lance Stephenson had a lot to do with the Pacers’ surge in the fourth quarter. Stephenson finished with 14 points and nine rebounds off the bench. ”When Lance plays like that and is effective like that, it takes a lot of pressure off of everybody. He did a great job on both ends (of the floor), especially on the defensive end and slowing them down a little bit,” Oladipo said. The 76ers made six straight 3-point attempts in the second quarter but made just one of their 14 shots from beyond the arc during the second half. After the 76ers did not commit a turnover in the first quarter, they finished with 18 total turnovers, including seven in the fourth quarter alone. 76ers: Four of Philadelphia’s five starters scored in double figures. Philadelphia’s entire starting unit has scored in double figures 17 times this season. . Simmons has scored at least 10 points in 40 of the 76ers’ 49 games this season. . The 76ers have now lost four straight road games. Pacers: Nate McMillan returned to the Pacers bench after missing Friday’s game in Charlotte due to personal reasons. . Indiana has now won six straight at home. After recording a double-double in a win against Memphis on Wednesday (15 points, 11 rebounds) and a double-double in a loss to Charlotte on Friday (19 points, 11 rebounds), Myles Turner found himself in foul trouble early against Philadelphia and missed much of the first half. Turner finished the game with no points, three rebounds and two assists. Embiid recorded his fifth consecutive double-double. Despite the organization’s concerns regarding Embiid and back-to-back contests, Philadelphia’s All-Star center was glad to be on the floor for both games. ”I’m happy that I finally got to play in a back-to-back, but I wish we’d gotten the win. Overall, though, I felt great. I wasn’t tired, my legs were fine, my body was fine,” Embiid said. 76ers: Host Washington on Tuesday. Pacers: Host Washington on Monday.